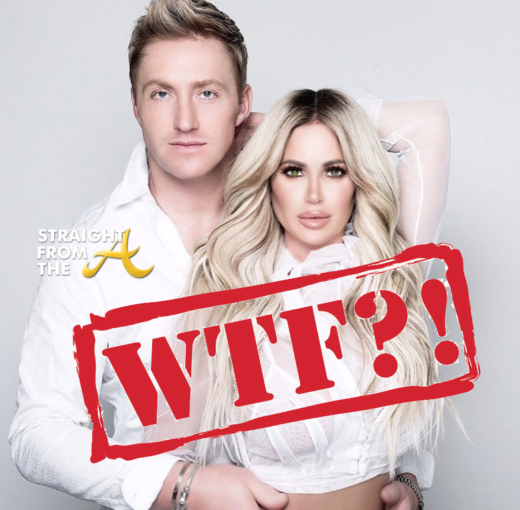 The image above was circulated online after KKKim Zolciak-Biermann posted (and deleted) via Instagram. Kim Zolciak-Biermann (formerly of The Real Housewives of Atlanta) birthed three babies within a year of each other and managed to regain her girlish figure almost immediately. Kim’s twins turned one last November and she’s been showing off her slimmed down frame online by posting a slew of selfies. Many fans suspect Kimmy paid a visit to one of the many plastic surgeons around town, but she may have opted for a cheaper alternative this time. The ‘Tardy for the Party’ songstress recently posted a questionable selfie via her instagram account and then snatched it down 20 minutes later. Unfortunately for Kim, one of my super readers caught the post and sent it over.